Or find out what we can help you with. Smiles have been our business at Blake Dentistry since 2005. As a family dental practice, we welcome patients of all ages. We combine the latest dental technology with a friendly, comfortable atmosphere to provide comprehensive dental care for the whole family. We strive to find treatment options that work best medically, financially, and aesthetically for each and every individual patient. We encourage our patients to partner with us and take an active role in their dental care. Dental emergencies can happen at the most inopportune times- on weekends, holidays, or after regular office hours. Don’t worry. At Blake Dentistry, we have a system in place for such a situation. If you’re a current patient of record with an after-hours dental emergency, call 814-274-7262. At Blake Dentistry, we combine the latest dental technology with old-fashioned small-town values and take the time to get to know you. You’re more than a number on a chart here! At Blake Dentistry, our mission is to provide the best comprehensive dental care to our patients. This means that although we certainly do provide emergency dental care when needed, we focus on establishing partnerships with our patients based on the “big picture” of overall oral health, in order to tailor each treatment plan and routine care to the particular oral health needs, conditions, and concerns of each individual patient. As a regular-care patient at Blake Dentistry, you’ll receive an individualized treatment plan based on a comprehensive evaluation of your oral condition. This individualized treatment plan also takes into consideration your own interests, needs, and concerns that pertain to your oral health and appearance. We bring our patients the latest dental technology to provide them with the most advanced, precise dental care. Our friendly staff is committed to making each appointment a pleasant experience. We see each patient as a partner in his or her own dental care, and to that end, we educate our patients on the various aspects of oral health. We think this education is just as important as the actual procedures we employ to bring your best smile to you. Whether you are a new or returning patient, we look forward to providing you and your family with comprehensive dental care. Please click below to make an appointment. Remember how when you’d visit a new dentist, you used to have to arrive at least fifteen minutes early in order to juggle a clipboard, pen, your insurance information, and your list of health concerns and medications while you filled out the new patient forms? Talk about awkward! Well, we’ve streamlined this process for you. Click on the link below to find our digital health and dental registration forms. Please fill them out in the comfort of your own home, prior to your first appointment and have all this information ready when you arrive. Not only will this save you time when you arrive at our office for your first visit, but will allow you a few moments to relax, gather your thoughts, read a magazine article perhaps, instead of having to frantically fill out these forms in the waiting room! At Blake Dentistry, you don’t have to travel to the big city in order to experience the latest in modern dental technology. Digital radiology lets us capture sharper, more detailed x-ray images with significantly less radiation exposure for our patients than conventional film-based radiology. 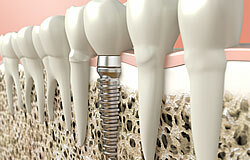 You don’t need to wait weeks for your crown, inlay, or onlay anymore! We provide high quality ceramic fixed restorations in a single visit, using the PlanMeca Fit System. 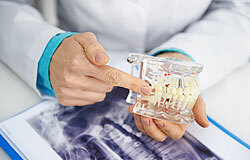 Once the stuff of science fiction, 3-D Implant Planning makes for more precise implant placement and a better result for the patient. Our soft tissue diode laser allows simple soft tissue surgery to be performed without bleeding and less trauma to the tissue. This means faster healing with less pain!